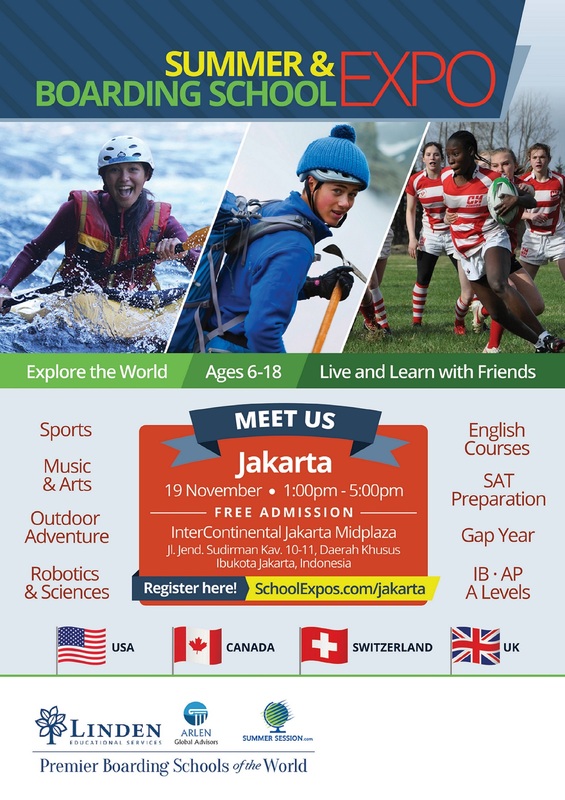 With large numbers of local students attending boarding schools for summer programs, one-year exchanges and more, an elite group of these schools is coming to Jakarta for an Expo for local parents, students and counselors. Boarding schools from across the US, Switzerland and more will be at the InterContinental Jakarta Midplaza on 19 November between 1:00 and 5:00 pm to speak about an array of programmes that take place on their campuses. This group of selective boarding schools offers some of the most sought-after and unique opportunities that children can experience. The extensive Expo offers a diverse range of schools with a vast array of locations, facilities and options that are a comprehensive mixture of philosophies and cultures. Among the prestigious grouping of 19 boarding schools are girl’s schools, schools with competitive sports, arts, robotics, and science programmes, Catholic schools, and schools with strong academic support programmes, the IB programme, AP programme, and ESOL courses. The Expo is free and open to the public. Students who are between six and 19 years can explore the various programmes. No reservations are necessary but pre-registration can be made at SchoolExpos.com/jakarta.